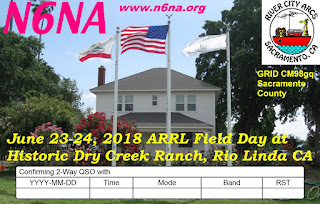 Our Field Day site is on the grounds immediately next to the Dry Creek Ranch House. Directions: Go 0.6 miles north of the intersection of Elkhorn Blvd and Dry Creek Road. Enter the 2018 Field Day Site through the main entrance on the east side of Dry Creek Road. Proceed on the driveway past the Ranch House and turn right behind the barn to the parking area. To avoid damage to the irrigation system, DO NOT DRIVE DIRECTLY ACROSS THE FIELD TO THE FIELD DAY SITE. Talk-in on our N6NA 145.25 MHz repeater. SET UP: On Saturday June 23th, all assisting should check in with our Field Day Captain by 6:45 am for task assignments so that we may begin setting up by 7:00 am. Members should wear their ID badge. If you bring a canopy see our Field Day Captain before you set up. We will have a set up plan based on layout of antennas. Bring the items you have committed. If you bring a laptop computer, our IT specialist Kevin Hooke KK6DCT will configure it for our network with the current N3FJP Field Day logging software. Label all personal equipment with your call sign.